The Class II, Type A Laminar Flow Biological Safety Cabinet provides protection for the user, product and the environment from particulate and aerosol hazards. The work area of the biological safety cabinet is continuously bathed with positive pressure ISO 5/Class 100 HEPA-filtered air to protect the product from contamination while an inward airflow protects the user. Approximately 70% of the air from each cycle is recirculated through the supply HEPA filter while the remaining air is discharged from the biosafety cabinet through the exhaust HEPA filter. The BBF Series (Class II, Type A) Laminar Flow Biological Safety Cabinet is designed for the safe handling of cytotoxic agents and other hazardous drugs in Laboratory, Pharmacy and Oncology settings. This biosafety cabinet eliminates cross-contamination and the accidental release of pathogenic microorganisms or carcinogenic aerosols and drugs to the outside atmosphere. Other applications for these biological safety cabinets include handling materials such as pollen, powders, allergens, dust, pathogen-free animals and plants. The work area of the biological safety cabinet is bathed with HEPA-filtered unidirectional (laminar) flow ISO 5/Class 100 air to protect the product and personnel. Further, the exhaust air of the biosafety cabinet is HEPA-filtered to protect the environment from particulate and aerosol hazards. This filter removes organisms and particulates 0.3 microns in size with an efficiency of 99.99%. It is even more efficient for larger and smaller particles. The laminar flow principle consists of moving individual streams of unidirectional, ultra-clean air along parallel lines with minimal turbulence. Approximately 70% of the air from each cycle is recirculated through the supply HEPA filter while the remaining air is discharged from the biological safety cabinet through the exhaust HEPA filter. This model can also be converted into a Class II, Type A2 Biological Safety Cabinet by adding an appropriate exhaust system to vent (duct) the remaining HEPA filtered air to the outside. The BBF Series of Vertical Laminar Flow Biosafety Cabinets passes the Biological Tracer Containment tests of the National Institutes of Health (NIH), the National Cancer Institute (NCI), and the National Sanitation Foundation (NSF). All units are NRTL listed with MET Labs to comply with UL 1262. The Class II, Type B Laminar Flow Biological Safety Cabinet provides protection for the user and the product from particulate, gases/fumes and aerosol hazards. The work area is continuously bathed with positive pressure ISO 5/Class 100 HEPA-filtered air while creating negative pressure airflow into the cabinet to provide user protection. All of the air entering the hood is ducted/vented to the outside of the building. The work area is bathed with a HEPA-filtered unidirectional (laminar) flow ISO 5/Class 100 air to protect the product. Further, the exhaust air is HEPA-filtered to protect the environment from particulate and aerosol hazards. This filter removes organisms and particulates 0.3 micron in size with an efficiency of 99.99%. The laminar flow principle consists of moving individual streams of unidirectional, ultra-clean air along parallel lines with minimal turbulence. This Class II, Type B2 Biological Safety Cabinet is a 100% Total Exhaust unit. The BTE must be ducted (vented) to the outside of the building as there is absolutely no recirculation of air in the cabinet. This total exhaust feature makes the B2 hood suitable for not only handling particulates, but also fumes and gases. The BTE Series of Vertical Laminar Flow Biological Safety Cabinets passes the Biological Tracer Containment tests of the National Institutes of Health (NIH), the National Cancer Institute (NCI), and the National Sanitation Foundation (NSF). 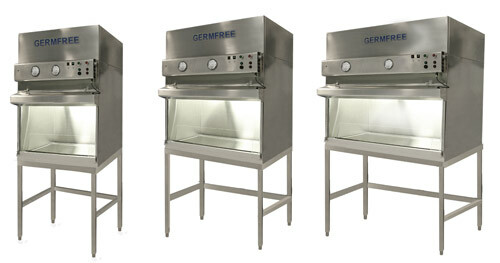 Germfree’s Class II, Laminar Flow Biological Safety Cabinets combine product, operator and environmental protection. These Biosafety Cabinets, also referred to as ‘Chemo Hoods’, are designed for the safe handling of cytotoxic agents and other hazardous drugs in pharmacy and oncology settings as well as in other compounding operations. Germfree’s wide range of Class II cabinetry is used to work with low to moderate risk materials and to provide a sterile working environment. These Biological Safety Cabinets eliminate cross-contamination or the release of carcinogenic aerosols and drugs to the outside environment. *Light housing and control panel adds an additional 4″ to depth. Depth dimensions include light housing. *Light housing and control panel adds an additional 4″ to depth.